“From the time we learn to speak, we’re told that if you don’t have anything nice to say, don’t say anything at all. When you become a manager, it’s your job to say it--and your obligation. 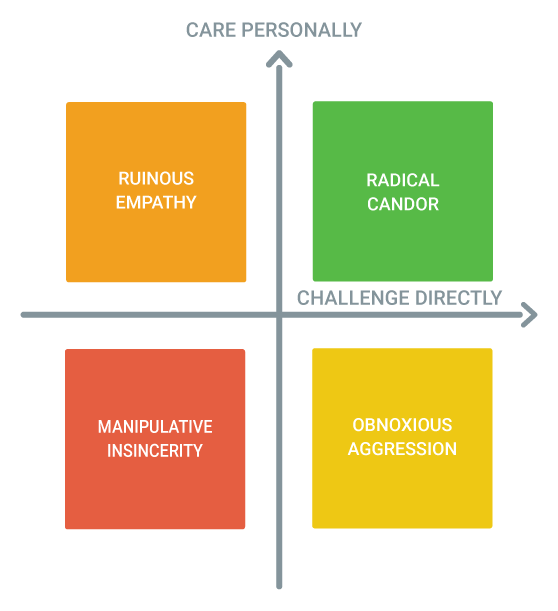 ‘Radical Candor’ is a simple idea: to be a good boss, you have to Care Personally at the same time that you Challenge Directly. When you challenge without caring it's obnoxious aggression; when you care without challenging it's ruinous empathy. When you do neither it’s manipulative insincerity. 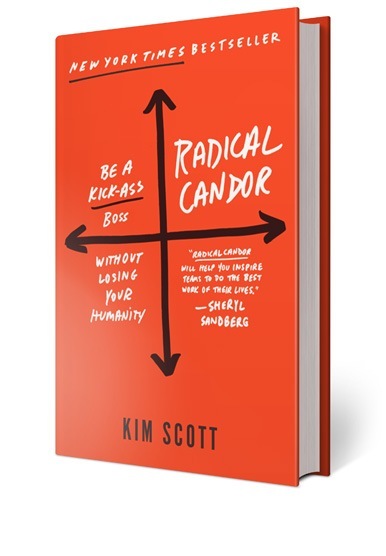 Radical Candor offers a guide to those bewildered or exhausted by management, written for bosses and those who manage bosses. Taken from years of the author’s experience, and distilled clearly giving actionable lessons to the reader; it shows managers how to be successful while retaining their humanity, finding meaning in their job, and creating an environment where people both love their work and their colleagues." When you're radically candid, you provide the guidance your team needs to improve, both on a personal level and a professional level. By building products and processes in a silo (made even worse by the fact I’m remote and literally by myself), I missed clear opportunities to involve my team - those who are on the front line with wonderful perspective. Because I didn’t involve them, it became an uphill battle to get everything off the ground. This could have totally been avoided. “You can’t give a damn about others if you don’t give a damn about yourself.” -- I was horrible at this. Within an hour, she responded. I know, it's crazy!